Nick Foles and Josh McCown were two of last season's most pleasant surprises, emerging from obscurity to post two of league's most efficient seasons. Both finished in the top 3 for Expected Points Added per Play, largely in part because the two combined to throw just three interceptions. With one week of the 2014 season in the books, Foles and McCown have already matched that combined total. While everyone should have expected both to regress from their remarkably turnover-free 2013 seasons, that does not tell us how far each should regress based on historical norms. This particular case raises questions about how far the leaders in interception rate fall. There have been plenty of studies conducted on yearly interception rate, and while offensive interceptions are more consistent than defensive picks, the annual correlation is still fairly weak. In a small 15-game sample size, someone like JaMarcus Russell could post a similar rate to Peyton Manning simply due to natural variance. By the way, when Russell started 15 games in 2008, both he and Manning posted an interception percentage index (INT%+) of 112, indicating that both were 12 percent above league average. 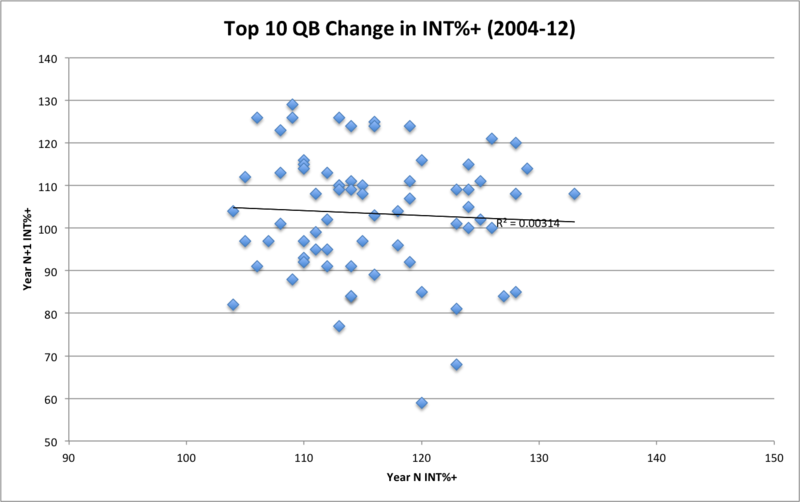 To set a baseline for regression, let's take a look at the top 10 quarterbacks in INT%+ (min. 10 games played), which is how many Foles accumulated last year) from 2004-12 and see how they performed the following year. I chose that time frame because illegal contact, defensive pass interference and defensive holding received greater emphasis after the 2003 AFC Championship game. Since then, regular-season scoring averages have ballooned from 20.8 points per game in 2003 to 23.4 points per game in 2013. For reference, it took 25 years (1978-2003) to experience a roughly equivalent jump in scoring before the rule changes. There are enough confounding variables in this study (individual talent, system, teammates, etc. ), but someone like Bart Starr who played in a run-heavy era with comparatively primitive passing schemes might as well have played a different game. As expected, the correlation coefficient indicates virtually no relationship between a quarterback who posted a top 10 INT%+ rate and his follow-up season. Overall, however, there is a noticeable drop, as quarterbacks dipped from a combined 115.8 average rate to 103.5 the next season, barely above league-average. We can see that the worst drops were far greater than the best gains. 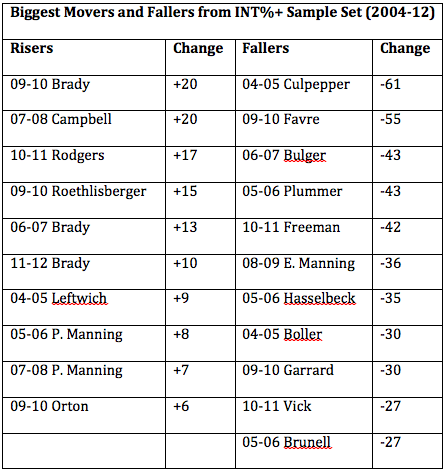 Though the odd Byron Leftwich or Kyle Orton type managed to help the overall average, the likes of Peyton Manning and Tom Brady were mostly the ones counterbalancing disastrous campaigns like Brett Favre's swan song or Daunte Culpepper's career-wrecking 2005 season. It's safe to suggest that Foles lies somewhere between those two extremes. The median change was minus-13; if we apply this to Foles, his INT%+ would drop from a league-leading 119 to 106. 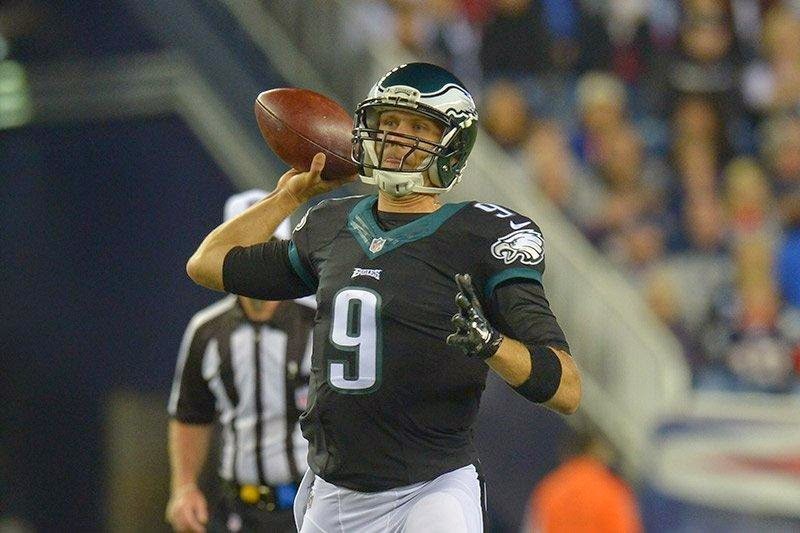 Prorating his number of 2013 pass attempts to 16 games (while also assuming the the league interception rate remains constant at 2.8 percent), Foles would be projected for 13.3 interceptions in 2014. Of course, when we have such a vast range of quarterback capabilities in the data set, it's hard to arbitrarily just toss Foles into the middle and suggest that's where his true skill lies. So to parse things down, I rejiggered this study and sought out quarterbacks who were more like Foles—anyone who had posted an above-average INT%+ (>100) within their first two years in the league (while also playing at least 10 games). To obtain a more robust sample size, I expanded the data range to the last 20 years (1993-2012). Yes, I realize this now violates my protests above, but I figure the common denominator of inexperience should tie these quarterbacks together fairly well. Regardless of system or era, a young quarterback playing heavy snaps is going to experience his share of struggles. The correlation is slightly stronger, but it's still clearly not meaningful. Interestingly, while the average index fell from 110.4 to 101.1, that's not nearly as steep a drop as the top-10 quarterbacks experienced. The list of qualifiers is somewhat auspicious for Foles; while there are clunkers like David Klingler and Tony Banks, the majority either were or could become long-term above-average starters at minimum. Most of the duds like Gabbert, Tebow and Russell washed out immediately and thus failed to qualify for the sample. Still, that 101.1 index checks in lower than the 106 index I gave Foles from the first sample. If we prescribe that number instead and use the same parameters as before, Foles would be projected for 14.1 interceptions in 2014. Though that's far from untenable, this updated total would have made Foles one of the 10 most intercepted quarterbacks in the league last season. With 14 career fumbles as well (including two already in 2014), it's not hard to imagine Foles being one of the five to eight most turnover-prone quarterbacks in the league this season. Foles' interception total will likely have a ceiling so long as the Eagles' sustain an otherwordly running game, something that appears likely if LeSean McCoy remains upright. But Philly's impregnable offensive line has already suffered long-term injuries to starters Evan Mathis and Allen Barbre, with the latter starting because normal right tackle Lane Johnson is still suspended for an additional three games. Depth is not the line's strong suit, and between pressured and non-pressured passes, Foles experienced the largest drop in DVOA of any quarterback last year. Some of that decline stems from the fact that he led the league in DVOA on non-pressured passes, but unless you want to advocate for Andrew Gardner or David Molk, Foles appears highly unlikely to receive such beneficial circumstances this year. One final note: you might be wondering what happened to Josh McCown, who I mentioned in the lede. Well, besides the fact that McCown had already compiled 1,113 pass attempts of backup-caliber play before his 2013 breakthrough, the list of quarterbacks who fared as well as he did in a small sample size is not promising. And after McCown's scattershot 2014 debut, you probably do not need me to tell you that he is more likely to follow in the footsteps of Damon Huard rather than Colin Kaepernick. Ultimately, while surprise stardom is one of football's many wonderful aspects, statistical regression often hastens the coming of midnight for these Cinderella stories. Someone will likely post a reasonable facsimile of Foles' ascension off the bench or McCown's late-career rise in 2014. They may not remain outliers for long, but it will be fun to witness while they are. 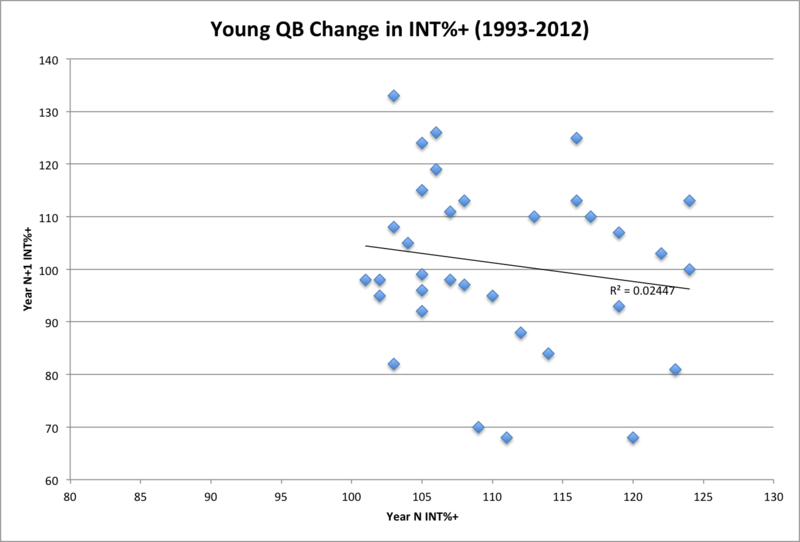 How useful is this if qb play is so inconsistent and turnovers are random? Would be helpful to have a confidence interval surrounding this estimate, or at least to have some t-statistics. From eyeballing the scatterplot, I'm not confident in your point estimate. Not sure everyone knows what INT%+ is (I don't). Going forward I'd suggest explaining any unusual statistics and why you'd use it instead of INT rate. Do this: Open Excel and in column A make a column of integers 0:20. This will be the number of interceptions in a season. In column B at the top write =BINOMDIST(A1,550,0.028,0). This is probability of throwing the number of interceptions in column A. Drag down. Notice where the probabilities are maximized. Your YoY correlations are zero, meaning the estimate for this year conditioning on last year's INT rate is the same as the unconditional estimate -- in other words, the highest probability INT rate, or 0.028*(Pass Attempts) rounded. I think some assumptions need to be made here. You grouped Foles in with others that had ALREADY had some bad years. I know it would reduce the sample size, but a think a more valid study would have included first year starters and the regression from there.